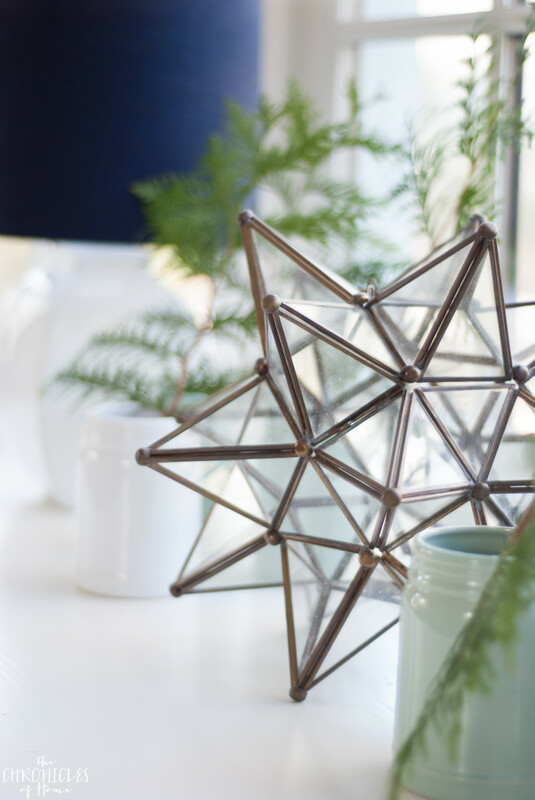 I have to warn you…while I have dabbled in a few Christmas posts up until today (a free watercolor printable, using cable ties while decorating, and a gift guide), it’s about to get verrrrrrry Christmasy around here. 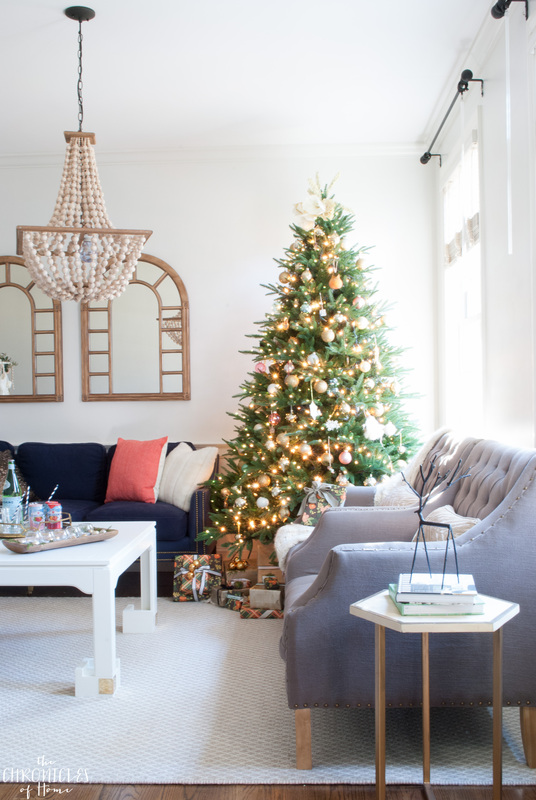 I have been a busy little Christmas elf the last couple of weeks and today I’m kicking off the Christmas decorating posts on the blog as the secret house on Jennifer Rizzo’s Holiday Housewalk. The annual Housewalk is a Christmas tour I’ve looked forward to and admired for many years now and I’m really humbled and honored that Jennifer invited me to participate. This year there is a surprise house that will be revealed each day of the Housewalk and I’ll be sure to let you know the rest of my secret colleagues as they’re unveiled. 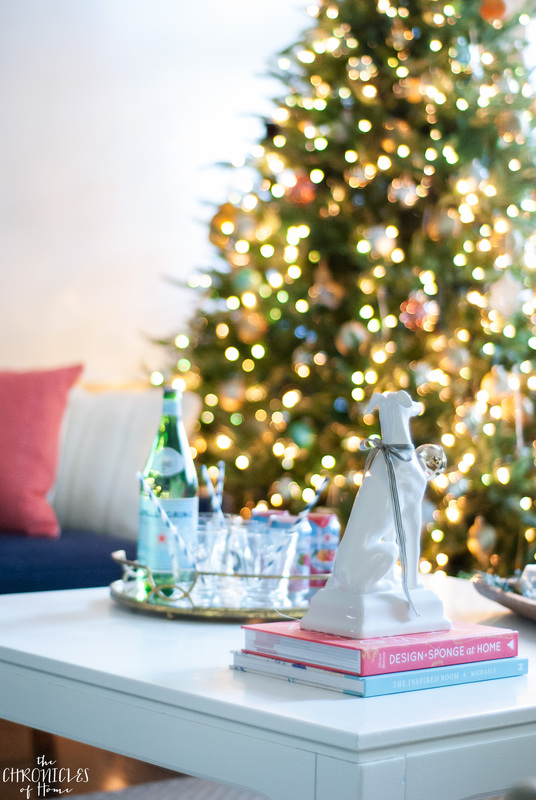 Today I’m sharing how I’ve decorated my living room and dining room for Christmas this year. 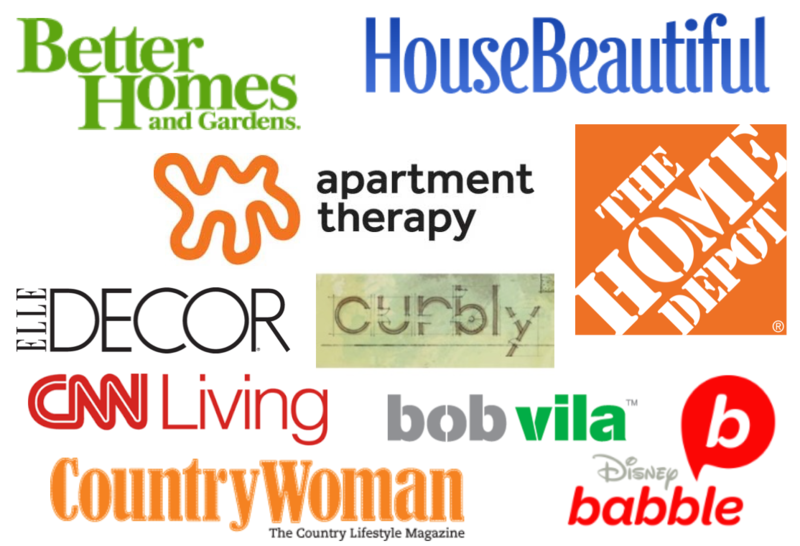 Check back on Wednesday to see what I did in the mudroom, kitchen, and family room and next Monday to see the entryway. 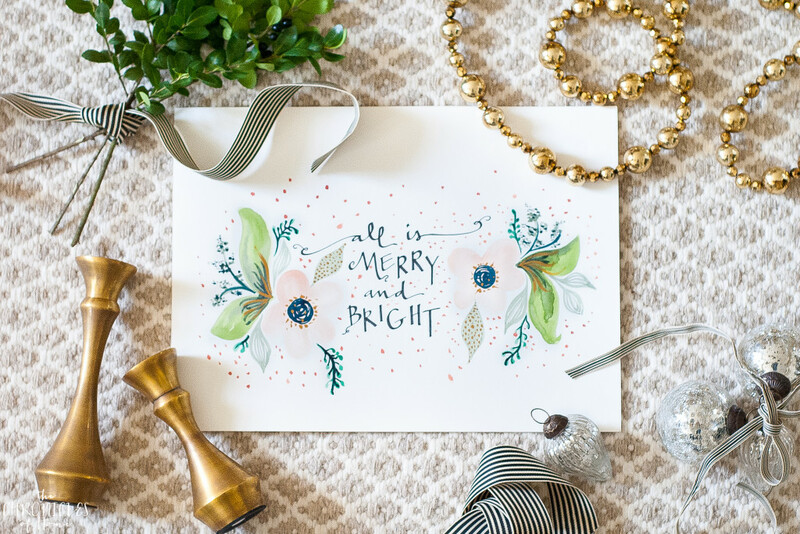 If you’re new here, I used this watercolor painting (which I’m offering as a free printable!) as my color muse this year – dark green, blush pink, navy blue, and coral. And I always like a little bit of black mixed in. With few exceptions, I really stuck with this group of colors in my Christmas decorating this year. 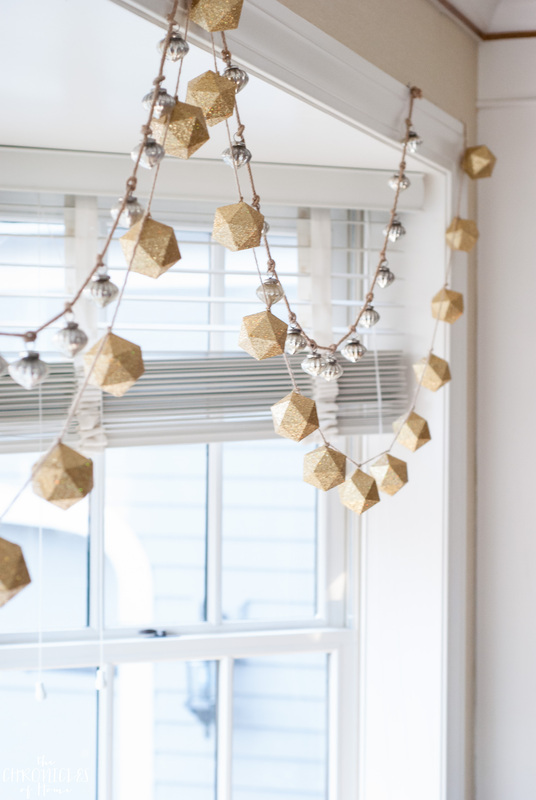 Now come on in and see how that color palette translated into my Christmas decorations. I’ll link to any products I used that are currently for sale as I mention them, and will also have a full source list at the bottom for easy reference. First up is the living room, where I decided to put our tree and Christmas stockings this year. 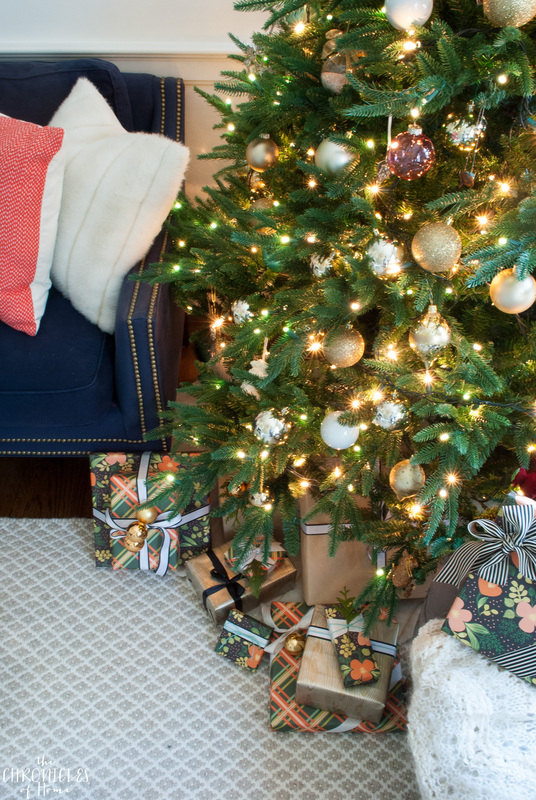 To keep the tree consistent with the color palette I was using, I used mostly gold ornaments and mixed in a few glass ornaments in blush and pale blue to tie in with the color palette. I also picked out anything from our sentimental ornament collection that had neutral colors and used them as well. There is little I look forward to more than putting the tree up every year and pulling out the bin full of ornaments Scott and I have collected since we were little. 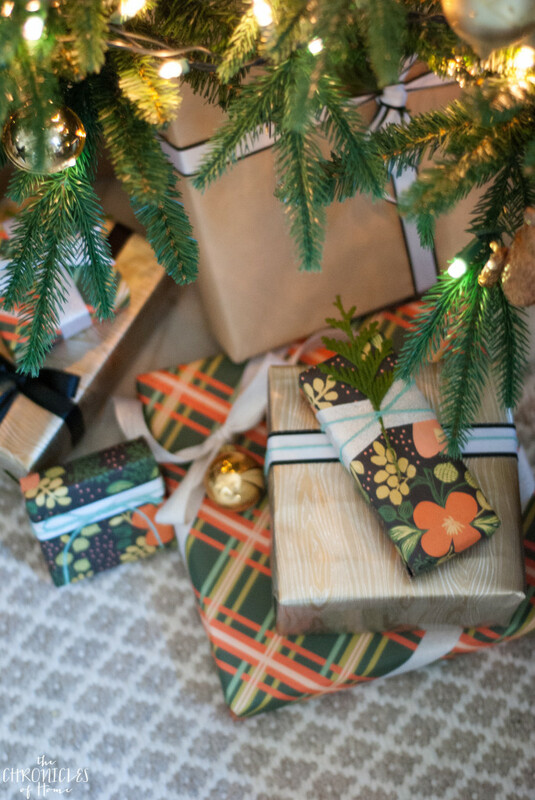 I wrapped gifts in a mix of brown kraft paper, a gold faux bois paper I picked up at Home Goods, and both floral and plaid paper from Rifle Paper company in green, coral, and blush. I used black and white ribbon and gold chevron ribbon for the bows. 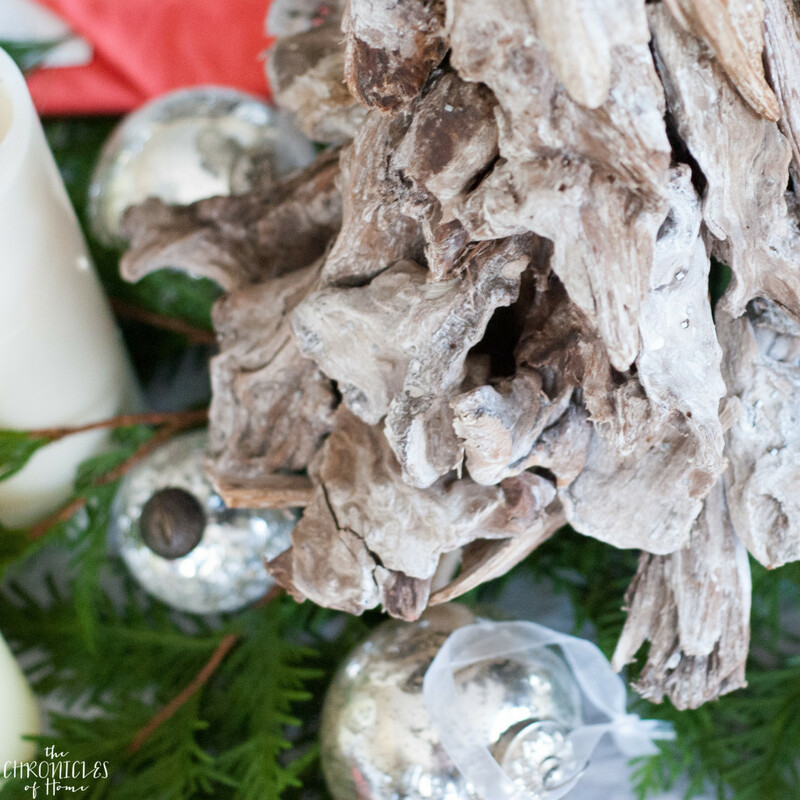 Ornament clusters and fresh greenery springs are my favorite gift adornments and really make a gift look extra special. 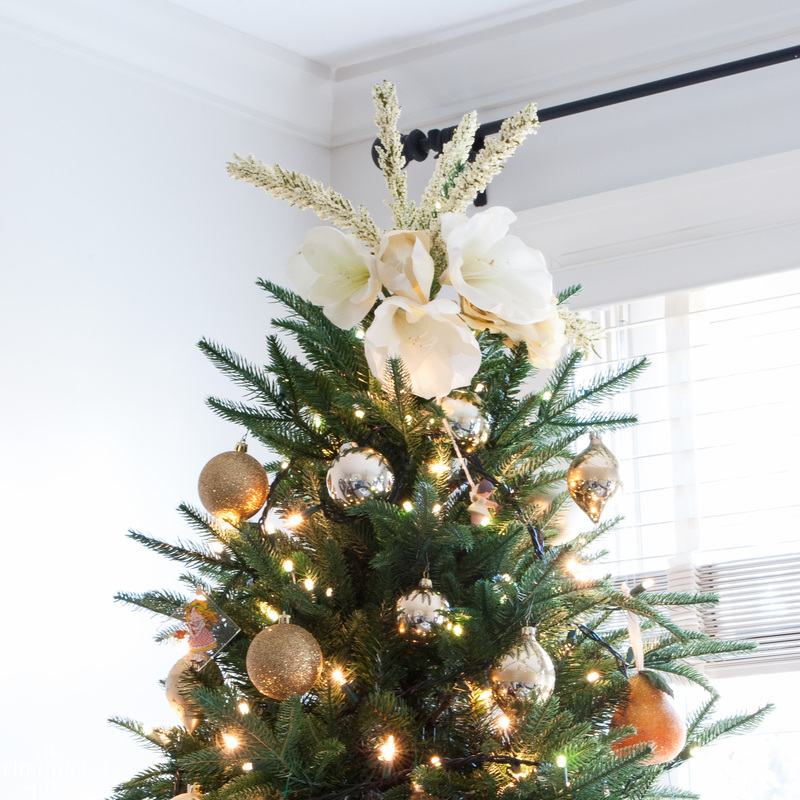 For the tree topper I clustered together some faux florals I had on hand and stuck them in! 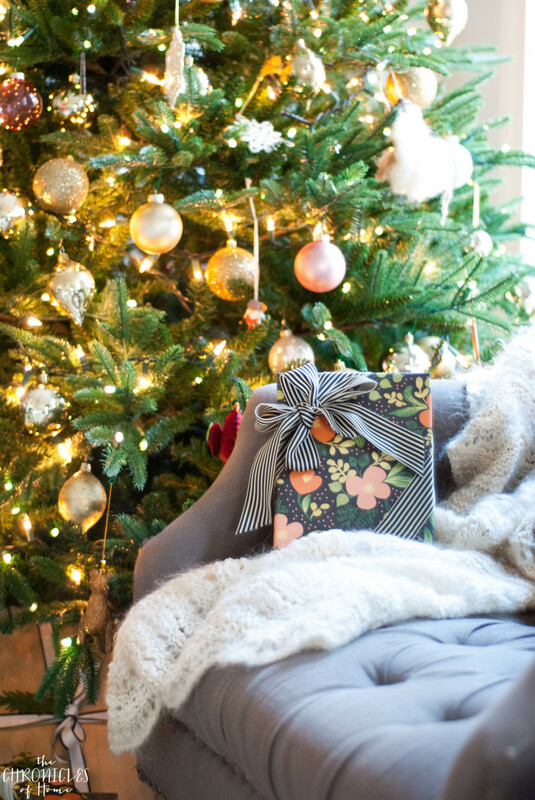 On the other side of the room from the tree our stockings hang from the mantle. 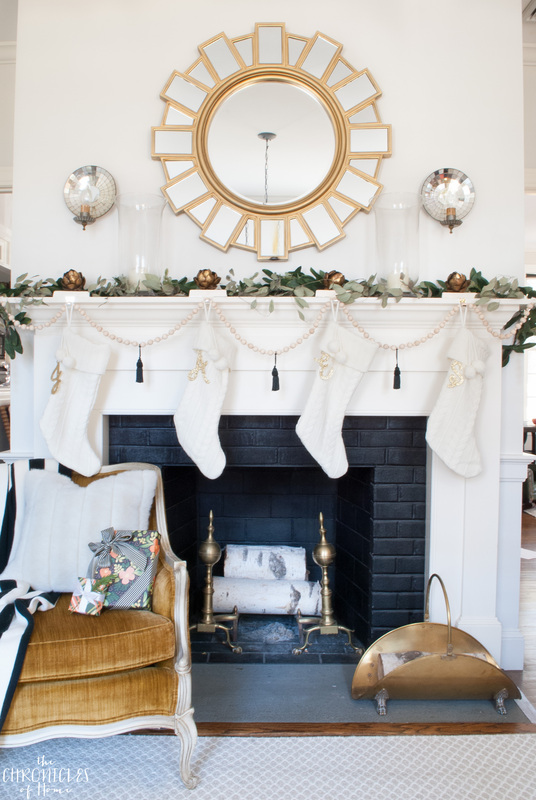 I have wanted white knit stockings for a couple years now but could never cough up $30+ per stocking for our family of four. These ones are only $13 each, though I had to go to two different store to get four of them – apparently I’m not the only one snapping them up! How adorable are the pom poms?? I kept the mantle really, really simple this year. 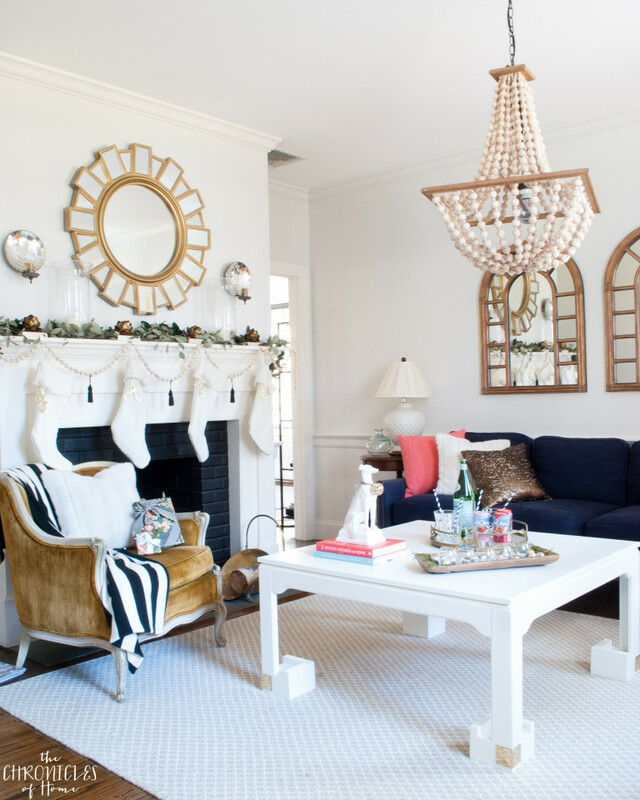 I did a more elaborate mantle last year that I loved, but I was feeling pulled to something visually quieter this time. 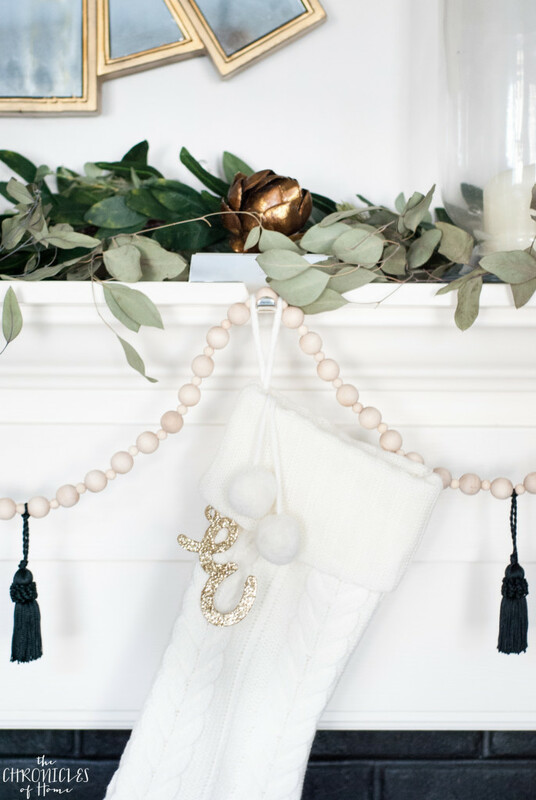 I made a simple wood bead garland to drape between the stockings and hung a black tassel between each stocking as well for a little extra embellishment. 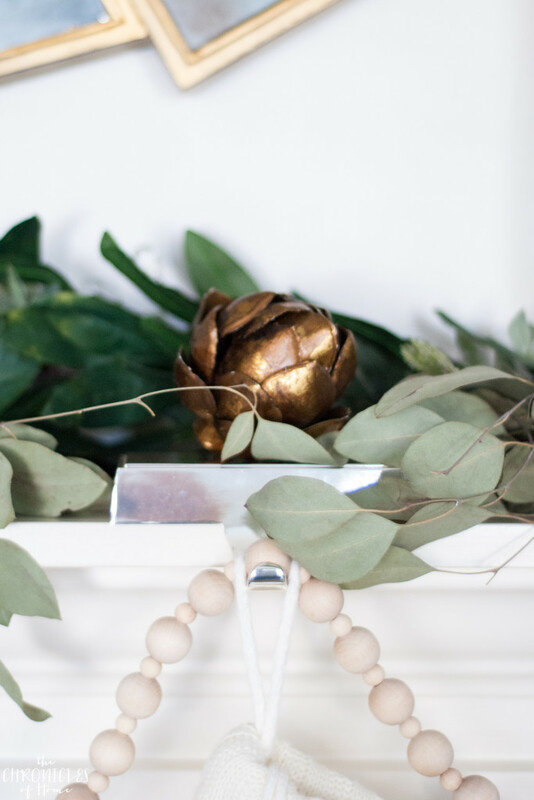 On the actual mantle I used a faux garland I’ve had for years and tucked in some dried eucalyptus to fill it out. I placed a metallic artichoke on top of each stocking holder (similar ones here). 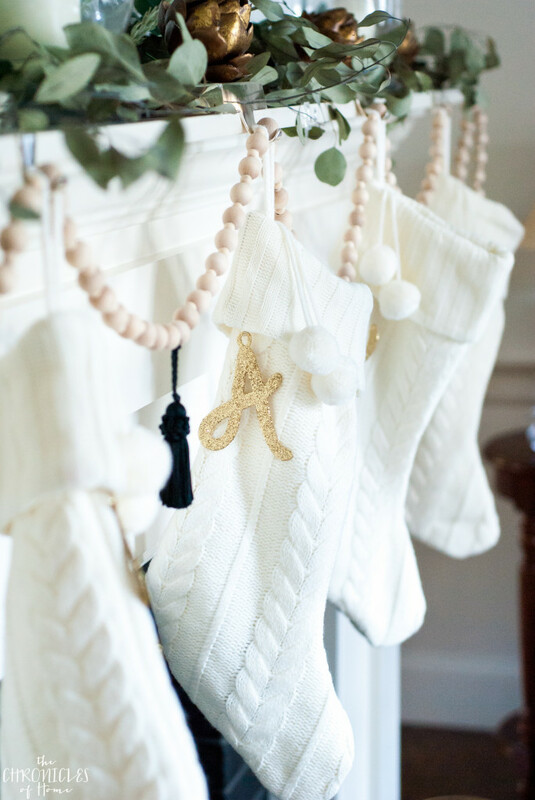 To personalize the stockings I hung a gold glittered monogram on each one. On the coffee table (details on this custom updated piece coming soon!) I made just a few easy groupings of things. My favorite ceramic dog statue got a new necklace. 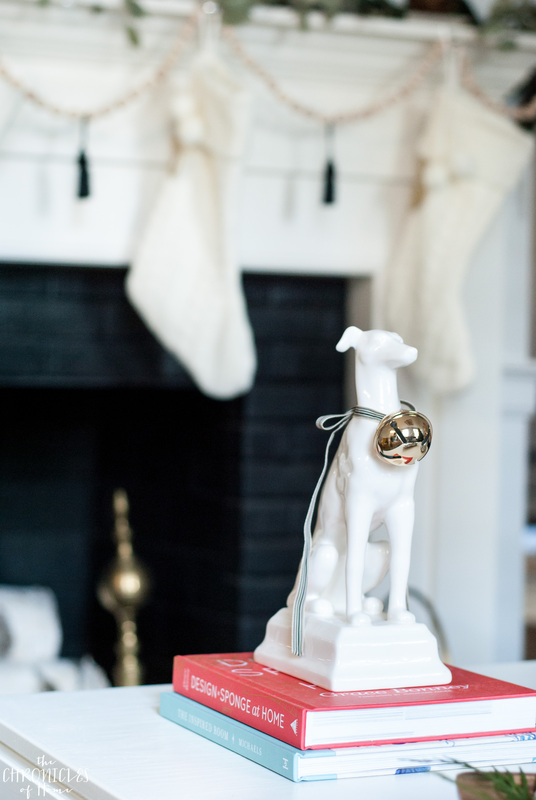 I have a history of hanging things from this little pup’s neck – this time I used a jingle bell and some ribbon for his adornment. I set some drinks on a mirrored tray – it’s under $30 and would make a great holiday gift. 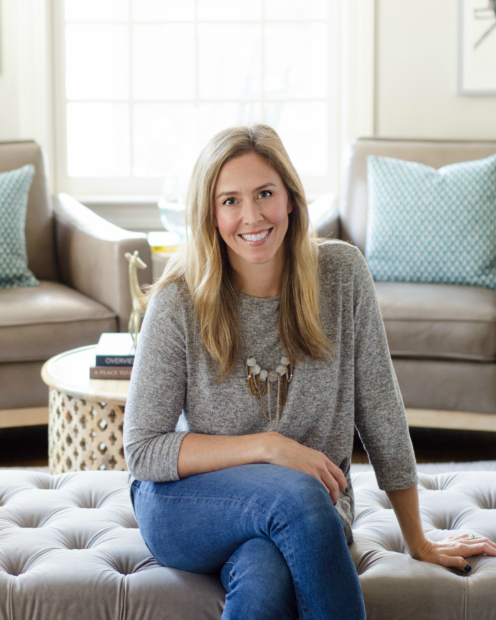 Just saying ;) I made the faux fur and sequin pillows that are on the sofa a couple years ago, but you can buy the coral stitched pillows now for under $20. 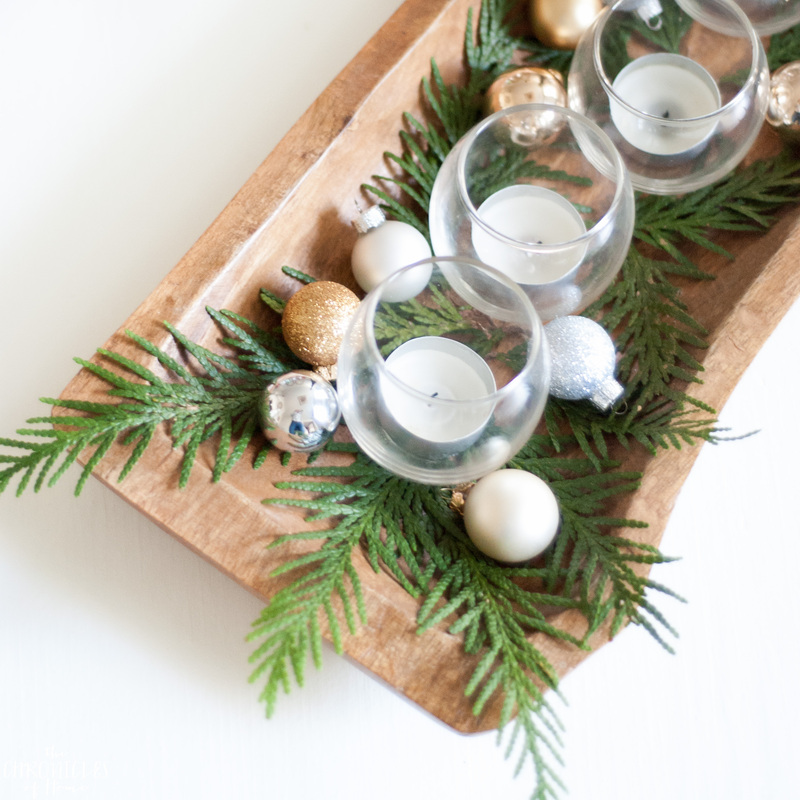 I decorated a small wooden tray with some tealights (similar holders here), mini metallic ornaments, and fresh greenery sprigs I clipped from my yard. 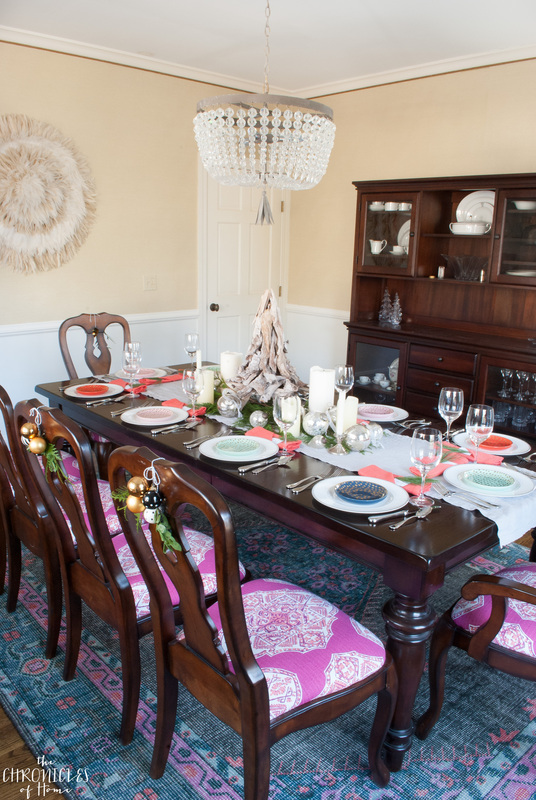 Across the hallway in the dining room, I kept things mostly neutral because of the colorful dining chairs and rug, but mixed in a little of my Christmas color palette to keep things consistent. 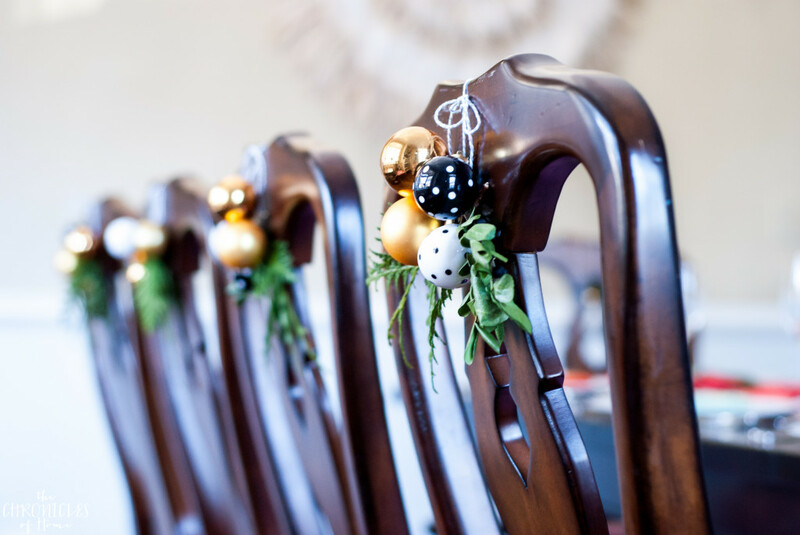 I tied little mini ornament and greenery sprigs onto the chairs, which may be my favorite detail in the whole room this year. 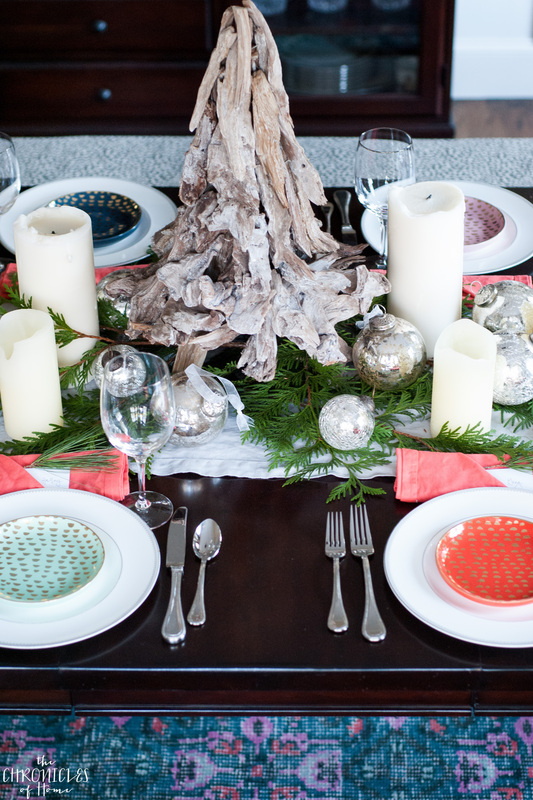 Actually, it’s a toss up for my favorite between the chair ornaments and the appetizer plates. 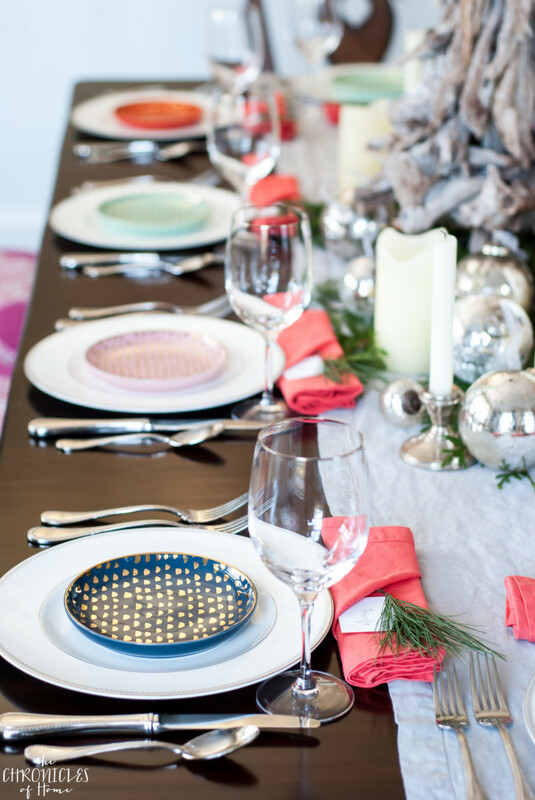 The colors of the plates are so pretty (and will be great any season) and added just a bit of color to my very neutral table. 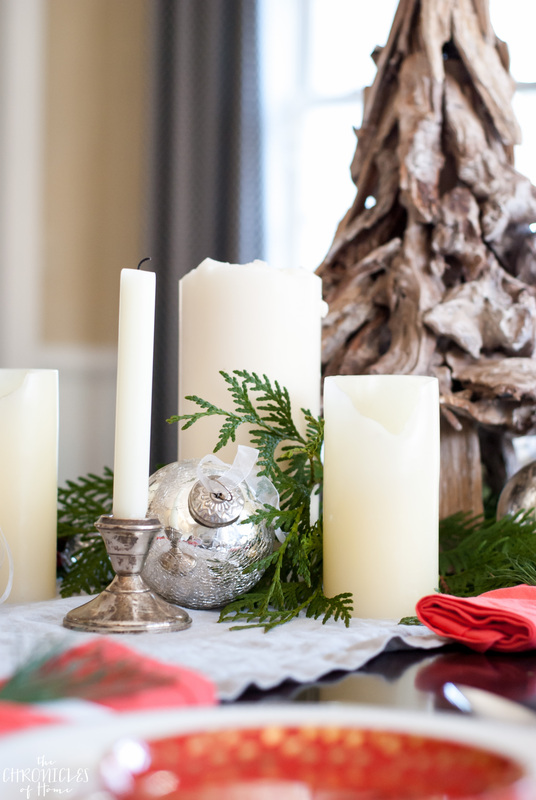 For the centerpiece, I started with a driftwood tree I picked up at Home Goods a couple years ago and nestled in some greenery cut from the yard, white pillar candles, and mercury glass ornaments. I folded coral napkins and tucked in placecards and a little white pine sprig, then placed them across the tops of the dinner plates. 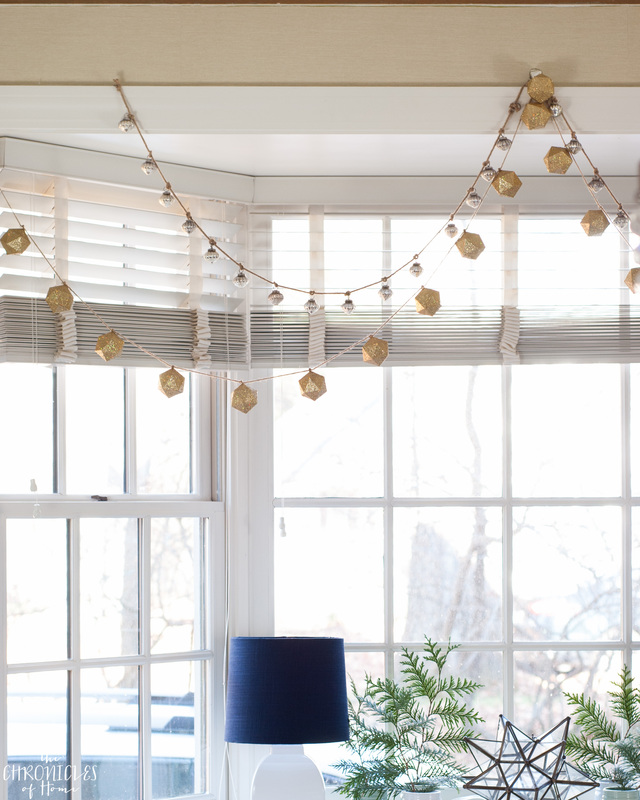 There’s a big bay window on one side of the dining room that I draped with a couple of gold geometric and mercury glass garlands. 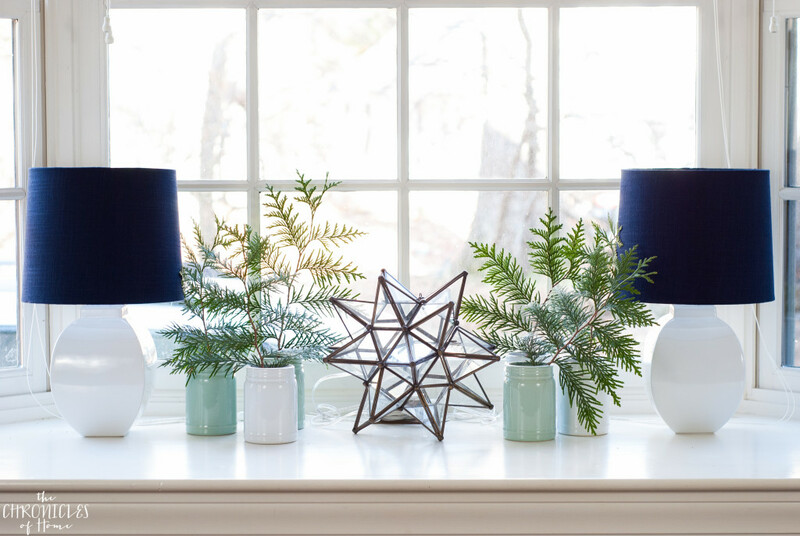 On the windowsill I put together a simple little vignette with a Moravian star and some cut greenery branches in ceramic vases. 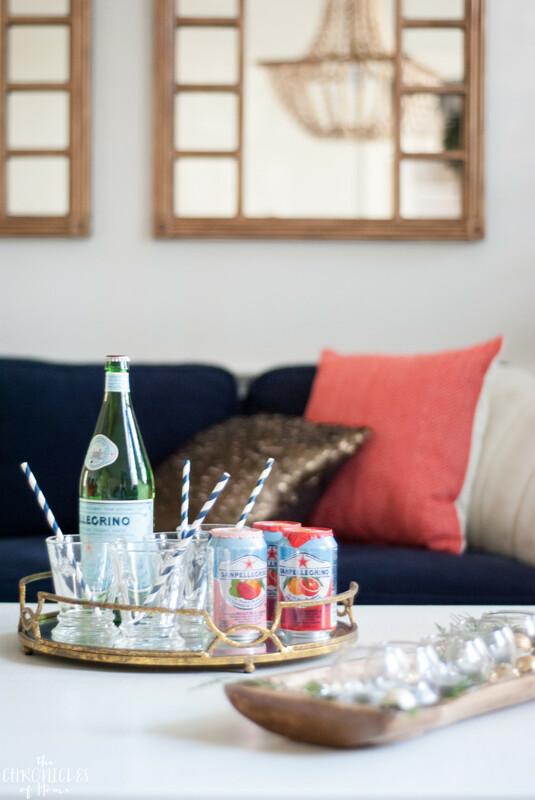 The next surprise house on the tour is Everyday Enchanting – make sure you swing by and say hi to Nina. We actually live pretty close to each other and met in October. She is such a sweetheart and has beautiful, classic style. 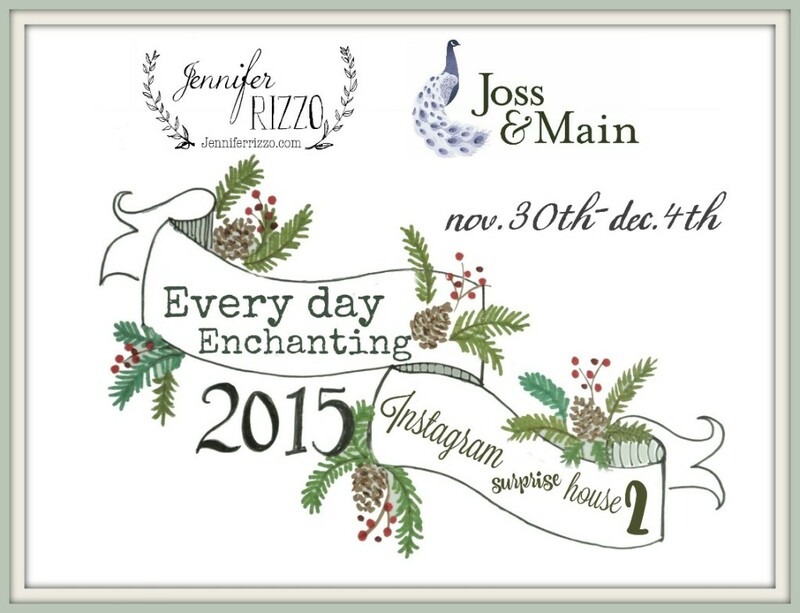 Here is the full 2015 Holiday Housewalk lineup too – you definitely won’t want to miss any of it!